Extract from the diary of a new Provincial Woman Education Officer in Northern Nigeria. 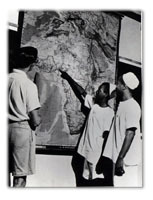 It was February 1947 that I, who was a quite a new recruit to the Colonial Education Service, set off on an inspection tour of schools which were accessible only by river. 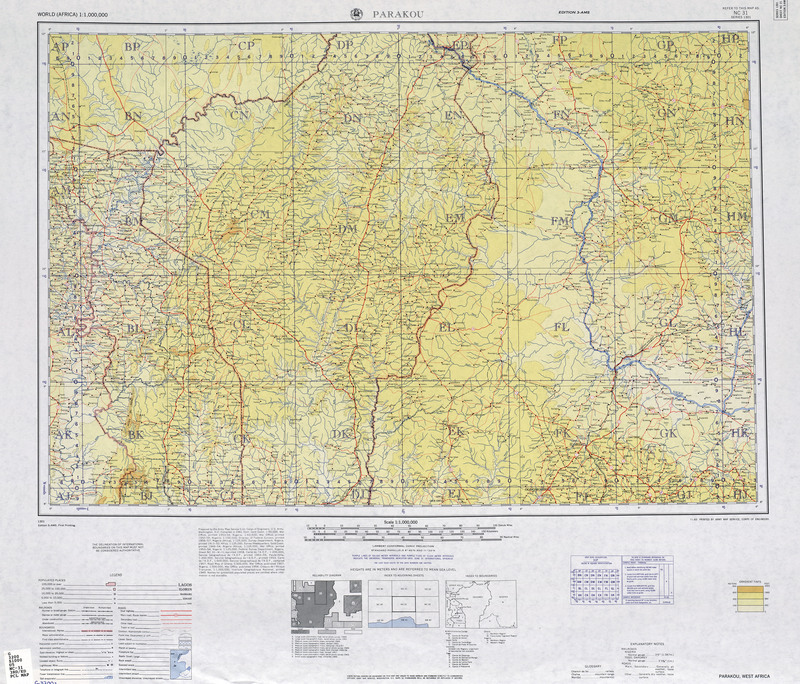 I kept a diary of this safari by canoe, and now, many decades later, my diary still has the power to excite me. 6.45 a m. Alison a friend from Fagos who was spending local leave with me) and I left Bida by N.A. 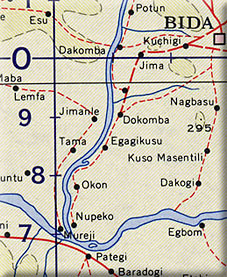 lorry for Dakomba, a village on the bank of the river Kaduna (Kaduna means crocodiles). We were delayed enroute by an unsafe 'bridge' over a culvert, which had to be filled in with grass, earth, stones etc to make it safe. We walked from Dakomba to the riverside, with some twenty carriers to carry our loads (on their heads). We took with us all our requirements for the next eight days. By 'all our requirements' I mean all, since these included table, chairs, beds, bedding, mosquito nets, bath (canvas), washbasin, lavatory seat, lamps, kerosene, all cooking and eating utensils etc. Two canoes were ready for us, one for Alison, me and our personal loads, and the other for Mallam Anike, Garba and Momman. We were astonished at the size of the dugouts which were about 60 feet long. We left the river bank at 8.45 a.m., by which time the sun was already fairly high in the sky and it was very hot. Alison and I both felt a thrill of excitement of a new and exciting adventure, albeit in the course of duty. The centre part of the canoe was roofed with matting made of split palm fronds. We made ourselves comfortable under the canopy and proceeded to have our breakfast, putting up the table in the approved manner. Below our starting point the River Kaduna widened out considerably, and the vegetation along the banks varied from open grassland to mixed grassland and forest. At 3.30 p.m. we caught our first glimpse of the lordly Niger, the appearance of which reminded us of Kipling's 'great, grey-green, greasy Limpopo'. It seemed enormously wide. At 5.00 p.m. we reached Mureggi. As we were approaching the village we heard the sound of drums, and suddenly, from round the bend of a creek, the sight which met our own eyes made us both gasp. We saw a huge dug-out canoe, with brilliantly coloured canopy and trappings. It appeared to be full of war-like Africans, brandishing what looked very much like dangerous and menacing spears. With their paddles (for such they were) waving in the air, they let out an ear-splitting yell of welcome and the drummers redoubled their efforts. As this State Canoe came nearer we saw Sarkin Ruwa, the local headman, standing beneath a very beautiful, gold tasselled canopy, surrounded by his councillors. They drew slowly alongside, and as we came face to face with Sarkin Ruwa, the drums suddenly ceased and every one in the canoe went down 'noses to the ground' in salute. When Sarkin Ruwa rose he greeted us, and I replied in what I hoped was a suitable speech (not very easy when one's knowledge of the language is as limited as mine!). The royal canoe then preceded us into the tiny creek at the head of which stands the village of Mureggi. Mureggi is built on a number of small knolls and, as we approached, it seemed to us that the landing beach and the rise immediately behind it were seething with people. The whole village had turned out to greet us. We learned from Sarkin Ruwa that few of the inhabitants of the village had ever seen a white woman before. We were informed that the rest house was not in a fit state to house us, and that some of the rooms in the Palace compound had been prepared for us. We were made to feel extremely welcome, and we were presented with an enormous giwan ruwa (a huge river fish) for our supper. I went to the school, which being so inaccessible, laboured under great difficulties, not the least of which is the fact that during the wet season i.e. 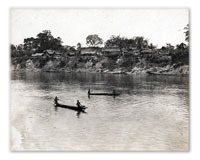 for about 5-6 months of the year, the knolls on which the village stands are surrounded by water and the children paddle their own canoes to school. 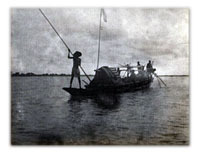 As the chief occupation of the people is fishing, the main craft of the boys is the making of nets, the raw materials of which is obtained from a particular kind of palm tree which grows in the vicinity. The girls spin and weave cotton, which is also grown locally. We are trying to encourage and preserve these local crafts in the school. I spent the morning at the school, and we left Mureggi at 11.30 a.m. amid the cheers of the people. We spent the rest of the day on the canoe, and it was midnight when we reached our next port of call, Katcha. Being paddled down the vast expanse of the Niger, in the rather ghostly light of a pale moon, was a never-to-be- forgotten experience. 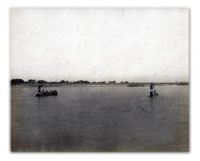 The swish of the paddles in the water, the rhythmical singing of the paddlers, and the various animal, bird and insect sounds which occasionally reached us from the banks made a delightful sound background to the scene. Arrived at Katcha, which lies some distance up the Katcha River from its junction with the Niger, we had to walk 1.5 miles uphill to the rest house and by the time our carriers arrived with the loads and our beds were unpacked and made up it was 2.00 a.m. We were much too thrilled and excited to feel tired. We were warned that there were many hyenas around and that we should not let my dog wander during the night. Up at 6.30 a.m. for school at 7.00 a.m. During our afternoon siesta we received a message to the effect that traders travelling by canoe had been chased by hippos. And then our carriers reported that they had seen several hippos, and advised us that it would be dangerous for us to continue towards Baro. We ascertained that there was a train from Katcha to Baro next day (there were only two a week), so we decided to make use of it. 4.30 p.m. saw me pedalling along the road to Loguma on the village scribe's bicycle to visit the school there. After our very late night we retired to bed early. I cycled to Loguma again to finish my inspection, visited the Baptist school at Katcha, and then we entrained in Baro. The shade temperature at Baro, at 5.00 p.m. was 97.7 degrees Fahrenheit, but having had little exercise recently, we braved the heat and climbed the hill behind the town. Our efforts were rewarded by magnificent views up and down the Niger. As the hippos had delayed us a day I tried to find some means of making up time, and to our great joy we found that the S.S. Mungo Park was leaving for Muye the next day. The Captain agreed to take us aboard and to tow the canoes. The carriers who had been instructed to come for our loads at 4.45 a.m. arrived at 3.00 a.m. My dog greeted their arrival with loud barking and there was noise and commotion until the blast of the Mungo Park's hooter, blown specially for us, sounded at 5.00 a.m. It was pitch dark as we made our way down the very uneven path to the jetty. We had to walk the plank by the light of a bush lamp, and climb the vertical ladders to the top deck of the Mungo Park in semi-darkness. There we found a bedroom at our disposal and a bathroom! Watching the dawn and sunrise on the Niger was breath-taking. The Mungo Park is a paddle steamer, and we chugged merrily downstream at a much faster rate than we should have done by canoe. We bade farewell to the Captain at 10.30 a.m. and boarded our canoe to take us into Muye Creek, a somewhat precarious operation in mid-stream. Sarkin Muye had planned to meet us in his canoe as Sarkin Ruwa had done, but as we arrived earlier than scheduled, he was somewhat disappointed. Mallam Anike went in by a back entrance to give warning of our approach and by the time we reached the landing stage the village was ready to welcome us. Sarkin Muye and all his councillors, the whole school and nearly all the villagers were on parade. We were most amused to see that many of the schoolboys wore brightly coloured cricket caps (Muslim men are not properly dressed without some sort of head covering). Once again we were told that a place had been prepared for us, Sarkin Muye proceeded to lead us to it, followed by the whole village. Our abode for the night turned out to be a half-finished mud house, with a grass veranda built on to it specially for our benefit. It was one of the most primitive that I had yet stayed in, but as we were sleeping out all the time, it didn't matter. I inspected the school that morning and in the evening I was taken to see the new school building which was started only a month previously, and was almost finished. The difference between the rough and ready methods which apply here and the elaborate plans drawn up for a new school building in Britain astounds me. 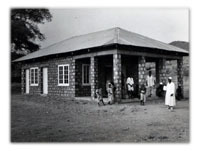 For instance, the windows (or rather holes in the wall) in the new building at Muye were far too small, and although the walls were already up to roof height, I was able to give instructions (after consultation with Mallam Anike and the Headmaster) for the windows to be enlarged and for more windows to be put in. I also decided upon the position of such buildings as the craft room, kitchen and Headmaster's house. There are no problems such as piped water or underground sanitation to be considered! We were given a great send-off by Sarkin Muye who accompanied us for a short way in his canopied canoe, complete with drums and queer, long, thin sort of trumpets. Before leaving however, we held a meeting of the parents of the schoolchildren, with Sarkin Muye and all the local village heads and councillors, some of whom had travelled as much as 12 or 18 miles by canoe to attend this meeting. They were very keen and interested in the school. Sarkin Muye told me that some of them, who as a result of their trading, had drifted to towns such as Lokoja and Onitsha, had returned to Muye when they knew that a school had opened there. During the year that the school had been in existence only four absences had been recorded. More hippos had been reported as having been seen on the river but we saw none of them. In any case, we simply had to travel by canoe as there is no other means of transport from Muye, except trekking along bush paths. We arrived at Rigido, a tiny village right on the river bank at 5.30 p.m., and again found ourselves in an odd-shaped, half-finished hut, this time without grass veranda. The path along the river bank is Rigido's main street. Our hut faced directly on to this and as we pitched our beds outside the hut it was like sleeping in the High Street. As we were leaving Rigido we were presented with yet another giwan ruwa (large fish) by an old man who said he had been out all night to catch it for us. The friendliness of everybody is a real joy. Rigido to Baro, upstream, takes about 12 hours, so we set out early. It was a very hot, oppressive day and we thought there must be a storm brewing. It blew up when we were about an hour's journey from Baro and, as ill luck would have it, we were on the 'wrong side' of the river, when the thunder rolled and a violent wind tore at the canopy of our canoe. As soon as we left the comparative safety of the river bank to cross the river, the water was lashed into waves. The paddlers had to work terribly hard to make any progress at all. As the top of the canoe was only a few inches from the surface of the water we felt that we were in danger, at any moment, of being swamped by a big wave, or of being precipitated into the water among the crocodiles. Alison felt really sea-sick. However, we reached the home bank in safety and the last lap along the edge was comparatively calm, and smooth going. We arrived at the rest house in the dark, only to find it occupied, but fortunately I knew the occupants and we were happy to share such accommodation as there was. But alas! Our second canoe was a long way behind and we had to wait an hour and a half for our food, beds etc. When at last they did arrive we learned that they had all been terrified when crossing the river in the storm. They told us that they had all shouted and sung at the top of their voices, presumably to drown their fears or to scare off the spirits of the storm. Our journey ended rather tamely the next day when we waited at Baro for over three hours for the lorry which came from Bida to take us home. But time doesn't matter at all in Nigeria, and one learns to possess one's soul in patience."